What minecraft_server.jar file? you said the actual server launcher wont work so where is the file we need to put the class in? Save it as <Something>.bat (not .txt!) in the same folder as minecraft_server.jar and then double click the .bat file. Do you think you could add Commands like /sethome and /home? I was working on a waypoint system previously but didn't make too much progress with it. I'll take a look again and see what I can come up with. Do you have a server that you want to manage without having to go to the device the console is on? Do you have JSONAPI and Dynmap and want a single organized page instead of changing tabs and having to navigate through long lists of actions? SimpServ will allow server developers to manage their server on any device from anywhere. It uses JSONAPI and Dynmap, combining them into an organized, usable tool. Chat and watch over your users with Dynmap while executing advanced functions with JSONAPI. Use it on any web browser from any device. JSONAPI allows the server host to manage their server on the go with things like Adminium and, of course, this. It allows the host to edit files in the server, see who is online, broadcast messages, execute commands, use the console away from the server, and tons and tons more! Adminium is great but costs $10 and can only be used on an iOS device. The JSONAPI Testbed (found on the plugin page) is a good tool to use to be able to use all of the default features, but can be very hard to find what you're looking for in a long list of things. SimpServ organizes all of the features, has a true real time console, and groups similar methods to make less scrolling, less clicking, and less stress. 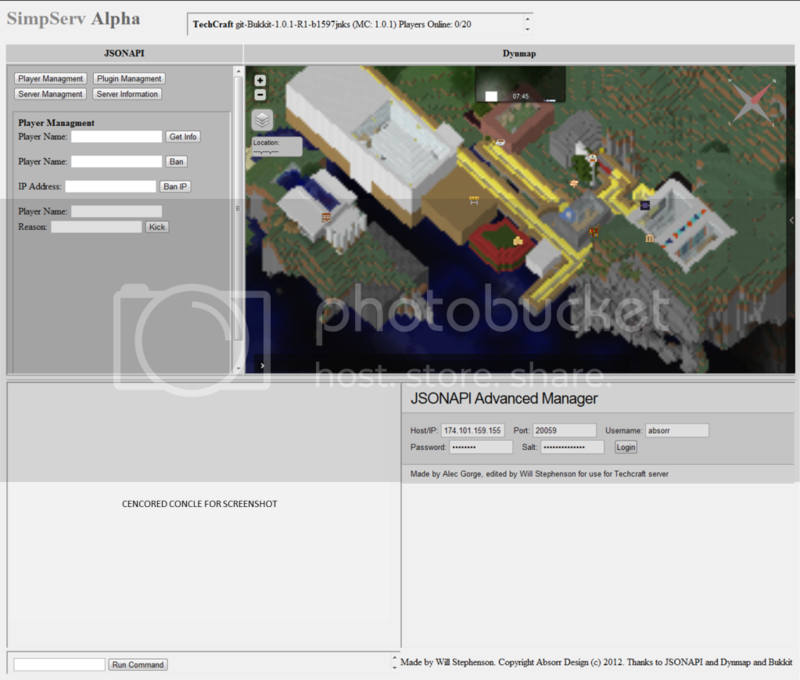 Dynmap (Minecraft Dynamic Map) allows players to view a map of their server with real time player locations, 3D view, markers with custom icons, chat, and multiple world support. 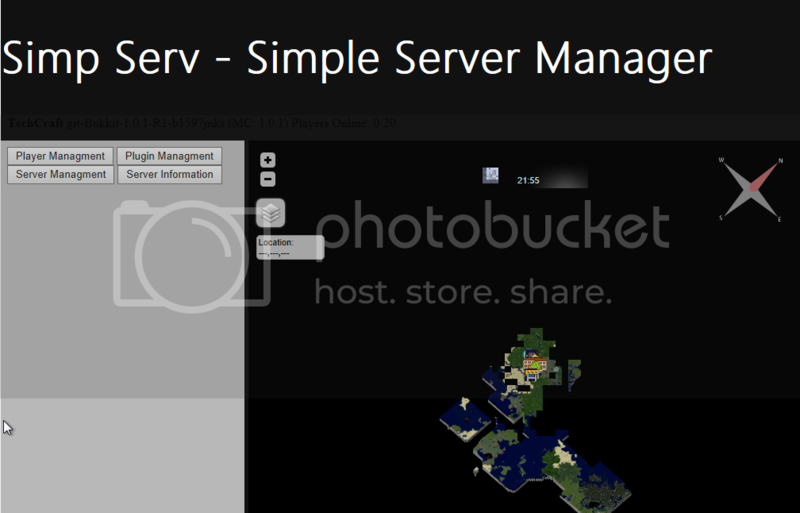 Dynmap is one of the best managing tools out there for your Bukkit server, so it was integrated right into it, putting the map right along side the JSONAPI managing tool, allowing you to manage your server while supervising those online. How can I get this tool for my server? SimpServ is available to order now! Get it for free while it is still in Alpha (maybe in Beta too)! Click here to get it now for free! Don't have CraftBukkit, JSONAPI, or Dynmap? Click on these links! We also now have an app for the upcoming Windows 8! Use all of the features in the Metro style of Windows 8! Available now! NOTE Windows 8 has not yet released but is in Beta. The Windows 8 SimpServ app requires that Windows 8 is installed. This app can not be obtained through the Windows Store. Wouldn't that be like the best achievement ever? Hey guys, I love this mod, especially with the aliases. I was wondering if you had any date in mind for when the update for Minecraft 1.1 will be out? Plans for the next version are already being made. We are going to make it so that if you made any custom methods in the config file for JSONAPI, you can put that in, or have us put it in for you. Also if you use other plugins that allow you to manage your server in some way on a web site, that can go in the same way as the custom methods. We will, as always, release more content related to the default methods in JSONAPI, in this case mostly the ones falling under the server information category. This is still in Alpha and all of the things you see in the JSONAPI Advanced Manager will be added in to be made more simple and more effective in a way that can fit with other methods, making them even more powerful. To recap, next version is to come when we feel like it is ready to meet the public, and will have custom methods and more JSONAPI features. If you find any glitches you would like fixed, post it here or to [email protected] and we will see what we can do. Pre-Releases will be given out each week to those who want them. To sign-up for pre-releases, just tell us at any time by e-mailing us at [email protected] and we will add you in. make sure you have at least 3 levels in the levels folder including a main. I was waiting for MCP to update, and now it has so I just need to update the mod. I'll see about tomorrow or this weekend. I got MCZomg today to set up, but I got a few errors and I'm not sure where to move on from here. (16:33:18) Error saving the MCZomgProp! (16:33:19) MySQL settings have not been set! Please reference the MySQL_Setup.txt file on setting up MySQL! (16:33:19) !!!Error! See logs/errors/2012-01-20error.log for more information. (16:33:30) No web server found to update on. I couldn't find the MySQL_Setup.txt file, and this may sound a bit noobish but where do I drag the maps so that it has at least 3 levels to start off with? <- I solved this part. I figured out the 3 levels part so I restarted it and now it's just the MySQL error which I'm not sure of. (16:40:48) MySQL settings have not been set! Please reference the MySQL_Setup.txt file on setting up MySQL! (16:40:48) !!!Error! See logs/errors/2012-01-20error.log for more information. (16:41:01) No web server found to update on. I was trying this server software out just now. I noticed the server restarted by itself when I join. This is the errors that it has been giving me. Message: Could not find a part of the path 'C:\Documents and Settings\Owner\Desktop\mczomg\levels'. I have 20 levels in the level directory. I also a main level. I noticed I have only 3 levels properties on the 'level properties'file with one called main. It's still d/c me when I join. (12:47:52) SkyBed and racetrack have been chosen! (12:48:05) No web server found to update on. (12:48:17) SkyBed was chosen by default! (12:48:21) Round starting in 3 minutes! (12:49:02) 71.81.5.60 connected to the server. (12:49:27) ALufkin24 [71.81.5.60] has joined the server. (12:49:27) !!!Error! See logs/errors/2012-01-21error.log for more information. (12:49:28) ALufkin24 kicked (Server restarted! Rejoin!). (20:45:49) racetrack and land have been chosen! (20:46:03) No web server found to update on. (20:46:14) racetrack was chosen by default! (20:46:18) Round starting in 3 minutes! (20:47:23) 71.81.5.60 connected to the server. (20:48:09) ALufkin24 [71.81.5.60] has joined the server. (20:48:09) !!!Error! See logs/errors/2012-01-21error.log for more information. (20:48:10) ALufkin24 kicked (Server restarted! Rejoin!). And then a few hours later, I got a new error when I was testing the server out with another person. It kept either restarting, close MCZomg by it self, or when me or my friend joins, it says 'MCZomg has stopped working'. Thanks for the heads up. I changed the links to point to the official page on BukkitDev so they will be more future proof. It is. Currently pausing on it though to make it so that I don't have to manually make it due to the increase of demand.